The Lotus Notes and Outlook are two immensely popular emailing clients which are mostly used by the enterprises to enhance their business and exchange of emails and files globally. But due to better services and user-friendly environment, the users are shifting their domain from Lotus Notes to Outlook. Though sometimes due to the professional need of the user, the user tends to shift their domain but find it very difficult to convert Lotus Notes to Outlook PST file format. This difficulty of conversion is due to the difference in the file format of Lotus Notes and Outlook. 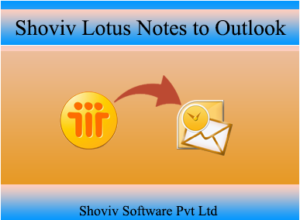 The Lotus Notes stores its files in NSF file format whereas Outlook saves its files and items in the form of PST file which means that the NSF files could not be supported in Outlook file format. Therefore if the user needs to convert these NSF files to PST files format the users are required to use Lotus Notes to Outlook converter for the successful conversion. What are the reasons for the conversion of NSF files to Outlook PST files format? Non availability of Lotus Notes: If the user wants to complete its pending work from user workplace it gets difficult for them to do so this is because of the unavailability of Lotus Notes in user personal computer or laptop. High cost of maintenance: The Lotus Notes is a technical emailing platform which comes with highly secured features and expensive application due to which the maintenance cost of Lotus Notes has also increased. Switching of Jobs: If the user changes its jobs to other company which does not use Lotus Notes but uses Outlook instead, then to work in the older files the user needs to convert NSF files to PST file format. How to convert NSF to PST file format? For the conversion of NSF files to PST file format there are multiple options available but the user must be aware of the advantages and disadvantages of using these methods so that the user can take a wise decision before converting NSF file to PST. Since there are no such direct methods to convert NSF to PST files manually is available. The user can either import and export method for the conversion of Lotus Notes to Outlook or can opt for third-party software solution i.e. Lotus Notes to Outlook converter. Since the import and export methods are lengthy which consume a lot of user time and does not provide the guaranteed result, therefore for the instant and easy conversion of NSF files to PST files we need to use the third-party Lotus Notes to Outlook converter. “Install” the program and “Run” the setup into your system. Open the program and go to “Add NSF” files in the ribbon bar. After the NSF file has been added. Select the “Export Outlook PST” option in the ribbon bar. After selecting the option a dialog box will pop-up in which the user need to check the item desired to export to PST files. Click “Next” to continue with the process. After clicking “Next” the user can export NSF file according to the various criteria such as “Item Type” and “Message class” then map the NSF files using NSF folder mapping option. Click “Next” to continue. After clicking “Next” the process will continue in which user can give “target folder” to the NSF file. Options are also “split PST files” or to apply “password in PST files”. Click “Next” and wait for the program to get complete. After the program is completed “Save” the report and “Finish” the program. The Lotus Notes to Outlook third-party solution the safest and secure way to convert NSF files to PST format without losing the hierarchy or integrity of NSF files and mailbox item. The software works much more quickly as compared to that of the manual version and allows even nontechnical user for work flawlessly. The software comes up with different features making the task of conversion less complicated. Note: If you are also interested to know about Lotus Notes to Office 365 Migration Issues, read our previous Blog.